The flood of 18 Jan 1921, at Crown Square taken from the Crown Hotel. Burgons, Provision Merchants is the mock-Tudor building in the background, later extended. 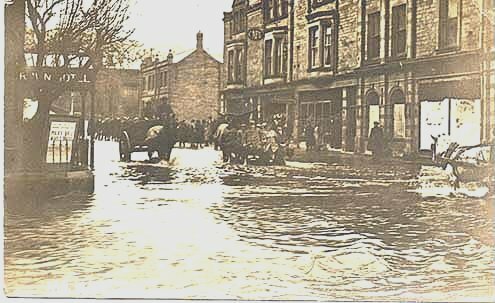 A lot of lower Matlock was flooded, although Matlock Bank was well above trouble. The River Derwent is quite liable to flood near Matlock. 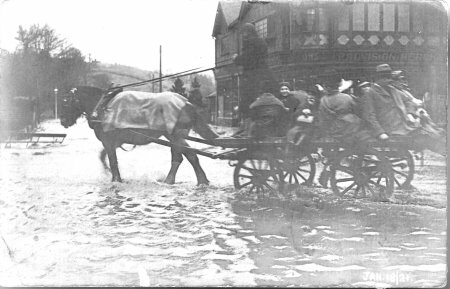 People were moved across the flooded Crown Square area by Horse and Cart. This cart may be heading for the start of Bank Road. The steep-gradient tram was also halted.